Target vest, love this too! The past few seasons, I've really taken notice of the soft, draped jackets and vests that bloggers have been wearing. I love how easily they layer on top of other pieces, but don't add bulk to an outfit. However, they do instantly add a chic touch. Originally I was in the market for an olive green cargo vest, but after spotting this lovely variation at Target of all places, I decided that the feminine counterpart was much more my style anyway. It can be worn in so many different ways: with a tee and jeans, shorts and a tank, and on top of a little dress as I've done here. I like the contrast of sweet ruffles and cream lace with an "edgier" vest. I put the term in quotations because this is probably as edgy as I get! It's fun to try new trends while still remaining true to my own personal style. As the late great Oscar de la Renta famously said, "Fashion is about dressing according to what's fashionable. Style is more about being yourself." And these days, I'd rather be myself. Linking up with Carylee and Rachelle today. 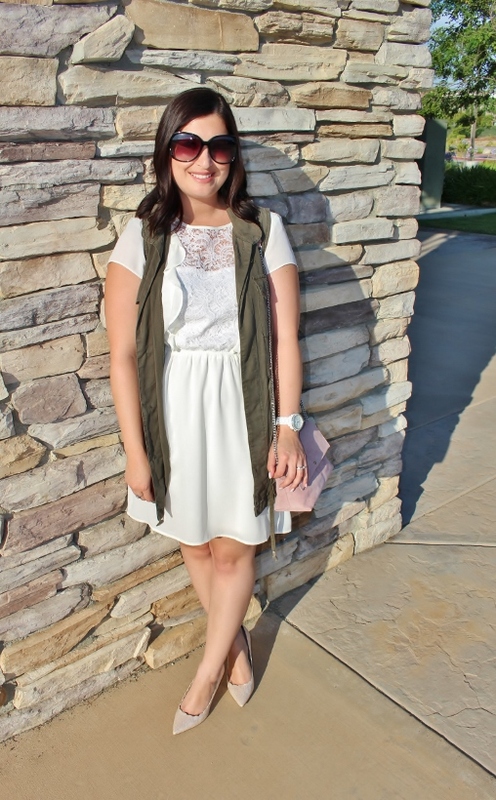 I love the combination of olive and lace- it works so well together! And I'm the same - I'd rather do my version of an outfit and ensure I feel comfortable these days! I have a question - I don't buy much from Express (except their OneEleven stuff), because their stuff is mostly polyester. I can't tolerate anything besides cotton and linen during heat. How do you wear polystere clothing in California? Isn't warm most of the time? That's a great question! I try to wear cotton most days too, but because these were taken in the evening, it wasn't hot at all. We went to dinner afterwards :) My rule is if it's over 90 degrees Fahrenheit, I stick to cotton. If it's under, I can wear polyester pretty comfortably. Cotton is always preferable though! I try to at least find a blend. I love a vest! This looks great with your dress!! Love this girly combo, you always look so cute and feminine. I do love how the vest dresses things down just a smidge, but those scalloped heels bring it right back up - they are divine! (though I might be biased as a lover of all things scalloped). 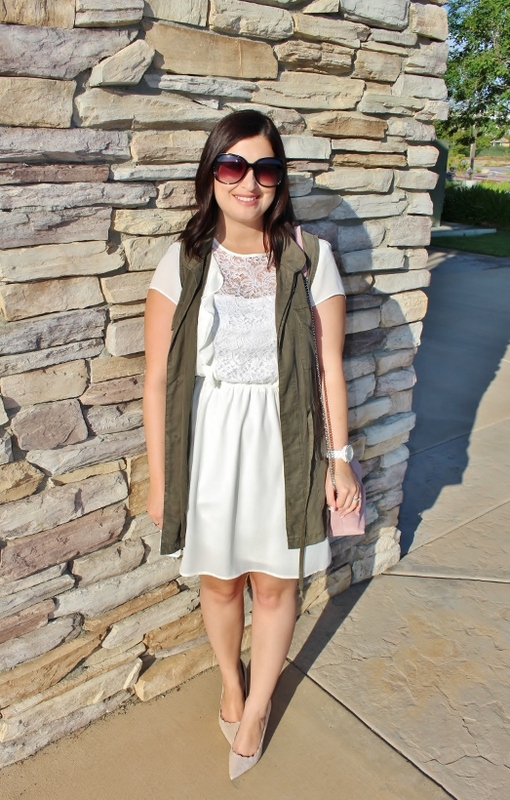 This vest is so perfect with your dress, I really need to try this! I am so on the same page! As my pregnancy progresses, I am going to look to chic layers like this to keep things interesting. Love the olive, white, and blush combo. I have that vest and love it!! Such a fun, versatile piece!